Description: Fresher and experienced female character actor required. Applicant must be good looking. Shoot Location- Punjab and Himachal. Budget as per profile. Role- Teacher. Description: Fresher and experienced female paralel lead actor required. Applicant must be good looking. Shoot Location- Punjab and Himachal. Budget as per profile. Description: Fresher and experienced female lead actor required. Applicant must be good looking. Shoot Location- Punjab and Himachal. Budget as per profile. Description: Fresher and experienced male and female telugu supporting actor required. Applicant must be good looking. Budget as per profile. Description: Fresher and experienced male and female telugu child actor required. Applicant must be good looking. Budget as per profile. Description: Fresher and experienced male lead telugu actor required. Applicant must be good looking. Budget as per profile. 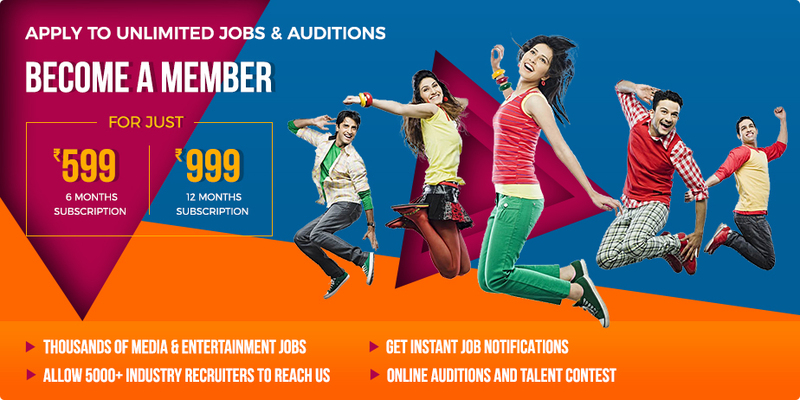 Description: Fresher and experienced male and female telugu character actor required. Applicant must be good looking. Budget as per profile.